Lawyers for “high value detainee” Abu Zubaydah – who was waterboarded 83 times by the CIA – have today filed a new submission concerning his transfer to and from a prison site in Lithuania. The filing, by London-based organization Interights, comes as Reprieve releases new information showing how renditions contractor Computer Sciences Corporation (CSC) arranged covert flights connecting Lithuania to other countries in the CIA’s secret prison network, including Morocco and Afghanistan. The revelation comes ahead of a debate in the European Parliament, led by rapporteur Hélène Flautre, on a new report on the kidnapping – or ‘rendition’ – and illegal detention of prisoners in European countries by the CIA. The US intelligence agency ran a so-called ‘black site’ outside Vilnius between 2004 and 2007, where detainees were held without charge. In their new report, the European Parliament’s Justice Committee concluded that “the layout of the buildings and installations inside appear compatible with the detention of prisoners” and that “many questions related to CIA operations in Lithuania remain open” despite a judicial investigation which closed in January 2011. The post-war reductions of CIA personnel in Iraq could provide greater opportunities for contractors with niche capabilities in intelligence collection, processing, and analysis. The Wall Street Journal reported that the CIA is considering plans to reduce its presence in Iraq to 40% of wartime levels due, in part, to Iraqi officials’ unfavorable feelings toward a major CIA presence in the country.1 U.S. officials have since complained that deteriorating communications with Iraq have resulted in significant losses of situational awareness regarding the activities of al-Qaeda in Iraq. As a result, the CIA and other members of the Intelligence Community (“IC”) will have to shift operations back toward traditional intelligence collection and will need the help of private contractors to augment such a shift. Soldiers themselves, Ben and Beau knew what their fallen brother had experienced and seen. They knew the difficulties of being a warrior and a devoted husband, and what a testament it was to Jeremy’s character that he had excelled at both. Two years later, Ben died at a hospital in Germany after an insurgent attack left him with injuries that first cost him his legs, then cost him his life. He was 34, a year younger than Jeremy was when a suicide bomber killed him at a CIA base where he was working as a defense contractor. 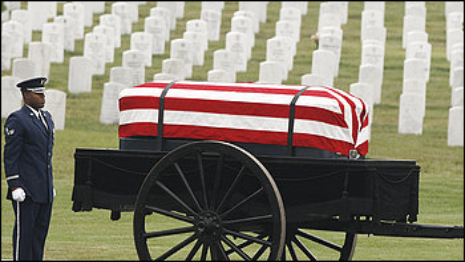 For a family that had already paid the highest price of war, it was time for another funeral, another eulogy, another grave. The eldest Wise boys are two of the thousands of Americans who have died since the conflicts in Iraq and Afghanistan began. But they share a link that most do not: They were brothers. “They laid down their lives, both of them, so that others could live,” their mother, Mary Wise, said. 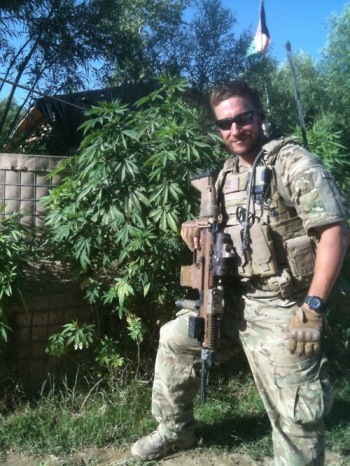 Jeremy had just retired as a Navy SEAL and was working as a defense contractor in Afghanistan. He thought he could spend more time with his family that way and still serve his country. When he was home in Virginia, he played ninjas with his stepson, Ethan, and hung around his wife, Dana, even if she was doing something as mundane as laundry. 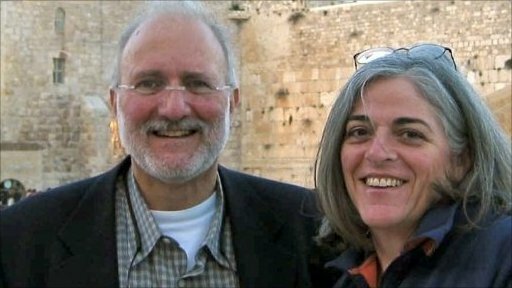 Piece by piece, in backpacks and carry-on bags, American aid contractor Alan Gross made sure laptops, smartphones, hard drives and networking equipment were secreted into Cuba. The most sensitive item, according to official trip reports, was the last one: a specialized mobile phone chip that experts say is often used by the Pentagon and the CIA to make satellite signals virtually impossible to track. The purpose, according to an Associated Press review of Gross’ reports, was to set up uncensored satellite Internet service for Cuba’s small Jewish community. The operation was funded as democracy promotion for the U.S. Agency for International Development, established in 1961 to provide economic, development and humanitarian assistance around the world in support of U.S. foreign policy goals. Gross, however, identified himself as a member of a Jewish humanitarian group, not a representative of the U.S. government. Cuban President Raul Castro called him a spy, and Gross was sentenced last March to 15 years in prison for seeking to “undermine the integrity and independence” of Cuba. U.S. officials say he did nothing wrong and was just carrying out the normal mission of USAID. The notorious Somali paramilitary warlord who goes by the nom de guerre Indha Adde, or White Eyes, walks alongside trenches on the outskirts of Mogadishu’s Bakara Market once occupied by fighters from the Shabab, the Islamic militant group that has pledged allegiance to Al Qaeda. Despite such thug talk, Indha Adde is not simply a warlord, at least not officially, anymore. Nowadays, he is addressed as Gen. Yusuf Mohamed Siad, and he wears a Somali military uniform, complete with red beret and three stars on his shoulder. His weapons and his newfound legitimacy were bestowed upon him by the US-sponsored African Union force, known as AMISOM, that currently occupies large swaths of Mogadishu. TEHRAN, Iran – An American man accused by Iran of working for the CIA could face the death penalty, the semiofficial Fars news agency reported Tuesday. In a closed court hearing, the prosecution applied for capital punishment, the report said, because the suspect, identified as Amir Mirzaei Hekmati, “admitted that he received training in the United States and planned to imply that Iran was involved in terrorist activities in foreign countries” after returning to the U.S. The prosecutor said Hekmati entered Iran’s intelligence department three times. The report said Hekmati repeated a confession broadcast on state TV Dec. 18. Under the Iranian law spying can lead to death penalty only in military cases. The Fars report said Hekmati’s lawyer, who was identified only by his surname, Samadi, denied the charges. He said Iranian intelligence blocked Hekmati from infiltrating, and under the Iranian law, intention to infiltrate is not a crime. The lawyer said Hekmati was deceived by the CIA. No date for the next court hearing was released. Hekmati, 28, was born in Arizona. His family is of Iranian origin. His father, who lives in Michigan, said his son is not a CIA spy and was visiting his grandmothers in Iran when he was arrested. “There are a lot of assumptions about contractors, and a lot of the assumptions are wrong.” Those are the words of a private security contractor who asked to be referred to only as “Lloyd” for this story, because like most of his colleagues he is not authorized to speak to the media. By Lloyd’s count, he has spent some 1,000 days working in Afghanistan in the past four years. He, like many other well-trained military men, decided to leave his position as a Navy SEAL and take his chances finding employment in one of the hot spots around the world where highly skilled contractors were well-paid, and in demand. Very few people outside the contracting industry really understood just what a private security contractor did before March 31, 2004. That was the day four American security contractors accompanying a shipment of kitchen equipment through Iraq were ambushed, killed, set on fire, dragged through the streets, and hung from a bridge before a cheering crowd in the city of Fallujah. As shock subsided, questions arose. Who were these American men? If they weren’t members of the military, what were they doing in one of the most volatile regions of Iraq? 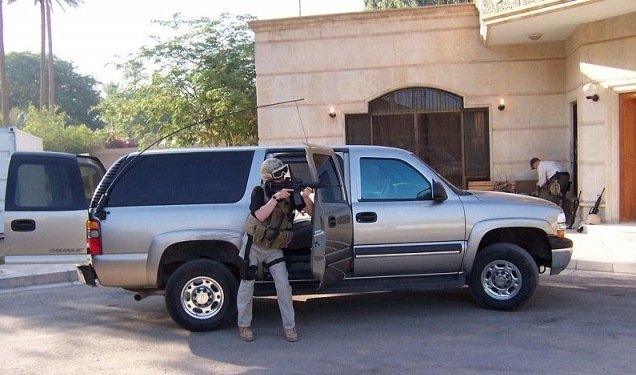 All four men were private security contractors working for a company called Blackwater. At the time the company, like many others, was just getting on its feet as U.S. demand for security services skyrocketed. The government needed armed, well-trained security personnel in hostile territories. The new push started when the United States went to war in a CIA-led operation in Afghanistan in 2001. e CIA’s early advance teams were not fully prepared for the pace of their own success. They quickly needed makeshift facilities to hold hostile enemy combatants and establish secure operating bases. The military wasn’t yet in a position to help, so the CIA hired Blackwater. It was a similar story when the U.S. invaded Iraq in 2003. A heavy presence of diplomats and reconstruction experts working in a hostile area meant they needed to be protected. Blackwater won a part of the contract to provide security services in the country. But being a private security contractor was a shady business, if not in the “legal” sense, in the “keeping off the radar” sense. 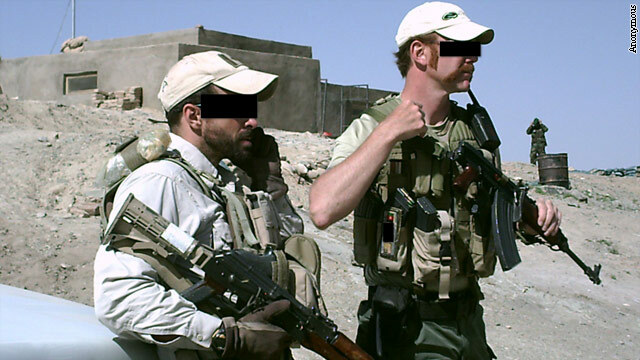 Many of the contracts that were granted to companies such as Blackwater included clauses that severely limited the companies’ ability to talk to members of the media. Contracting was, by the design of the U.S. government, secretive. President Obama announced on Friday that all 41,000 U.S. troops currently in Iraq will return home by December 31. “That is how America’s military efforts in Iraq will end,” he said. Don’t believe him. Now: it’s a big deal that all U.S. troops are coming home. For much of the year, the military, fearful of Iranian influence, has sought a residual presence in Iraq of several thousand troops. But arduous negotiations with the Iraqi government about keeping a residual force stalled over the Iraqis’ reluctance to provide them with legal immunity. But the fact is America’s military efforts in Iraq aren’t coming to an end. They are instead entering a new phase. On January 1, 2012, the State Department will command a hired army of about 5,500 security contractors, all to protect the largest U.S. diplomatic presence anywhere overseas. The State Department’s Bureau of Diplomatic Security does not have a promising record when it comes to managing its mercenaries. The 2007 Nisour Square shootings by State’s security contractors, in which 17 Iraqi civilians were killed, marked one of the low points of the war. Now, State will be commanding a much larger security presence, the equivalent of a heavy combat brigade. In July, Danger Room exclusively reported that the Department blocked the Congressionally-appointed watchdog for Iraq from acquiring basic information about contractor security operations, such as the contractors’ rules of engagement. That means no one outside the State Department knows how its contractors will behave as they ferry over 10,000 U.S. State Department employees throughout Iraq — which, in case anyone has forgotten, is still a war zone. Since Iraq wouldn’t grant legal immunity to U.S. troops, it is unlikely to grant it to U.S. contractors, particularly in the heat and anger of an accident resulting in the loss of Iraqi life. It’s a situation with the potential for diplomatic disaster. And it’s being managed by an organization with no experience running the tight command structure that makes armies cohesive and effective. You can also expect that there will be a shadow presence by the CIA, and possibly the Joint Special Operations Command, to hunt persons affiliated with al-Qaida. Defense Secretary Leon Panetta has conspicuously stated that al-Qaida still has 1,000 Iraqi adherents, which would make it the largest al-Qaida affiliate in the world. So far, there are three big security firms with lucrative contracts to protect U.S. diplomats. Triple Canopy, a longtime State guard company, has a contract worth up to $1.53 billion to keep diplos safe as they travel throughout Iraq. Global Strategies Group will guard the consulate at Basra for up to $401 million. SOC Incorporated will protect the mega-embassy in Baghdad for up to $974 million. State has yet to award contracts to guard consulates in multiethnic flashpoint cities Mosul and Kirkuk, as well as the outpost in placid Irbil. CHICAGO —September 28 A U.S. official and an Illinois family have identified the CIA contractor killed during a shooting at an agency facility in Kabul, Afghanistan. The father of 61-year-old Jay Henigan says his son was killed in the attack Sunday. Henigan was a lifelong resident of Sycamore, Ill., about 50 miles west of Chicago. Tom Henigan says his son had just begun his second stint working as a plumber for the CIA in Kabul. 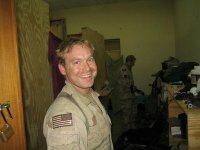 A U.S. official says Jay Henigan was shot by an Afghan worker who was providing security to the facility. The official requested anonymity because he was speaking about intelligence matters. KABUL, Afghanistan — An Afghan working for the U.S. government killed one CIA employee and wounded another American in an attack on the intelligence agency’s office in Kabul, officials said Monday. The assailant was killed. (Reuters) – An Afghan employee of the U.S. government opened fire inside a CIA office in Kabul on Sunday evening, killing an American and injuring a second, U.S. and Afghan officials said, in the second major breach of embassy security in two weeks. The CIA compound is one of the most heavily guarded in Kabul, and has been off-limits for almost a decade, since shortly after the Taliban’s fall from power in 2001. It also lies at the heart of the capital’s heavily-guarded military, political and diplomatic district, a virtual “green zone” that is almost impossible for ordinary Afghans to enter. The gunman was killed and the motivation for the attack is under investigation, said Gavin Sundwall, the embassy spokesman. The wounded American was evacuated to a military hospital for treatment. The killing was followed by a barrage of gunfire between 9 p.m. and 9:30 p.m. on Sunday. People who were near the compound where the attack occurred said they heard an explosion before gunfire erupted. The attack was at a building used by the Central Intelligence Agency in Kabul, according to several western officials. It is near the presidential palace. It was not clear whether the dead American was a C.I.A. employee, a contractor or someone else working on the grounds. Rarely visible, the agency has acknowledged few losses in Afghanistan. The last one that was made public was in 2009 when a suicide bomber penetrated the agency’s base in Khost Province, killing at least seven agency employees, including a senior operative. The C.I.A. station in Kabul, the agency’s largest outpost overseas part of the United States Embassy complex. 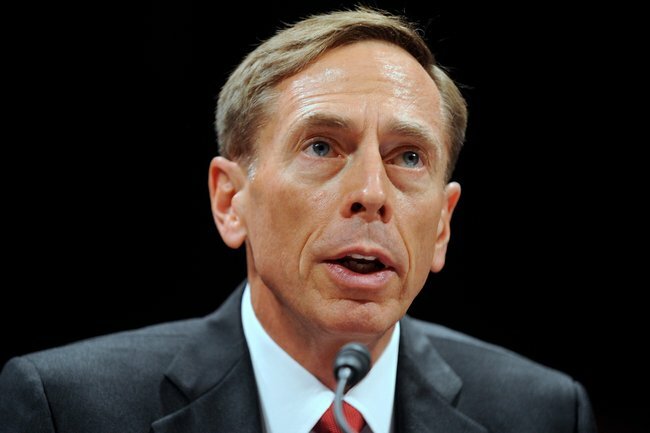 On Sept. 13, militants carried out a daylong attack on another part of the embassy grounds, and top American officials have attributed that attack to a group called the Haqqani network, which they say is supported by parts of Pakistan’s spy service, the Directorate for Inter-Services Intelligence. A C.I.A. spokesman declined to comment about the latest attack. Did CIA Rendition Flights Rely on Bogus State Dept. Letter? As the Washington Post and others have reported today, an obscure court case in New York state has led to the disclosure of new details on CIA’s extraordinary rendition program , in which the United States captured dozens of alleged terrorists  and sent them to secret prisons overseas. But what really caught our eye are potentially forged State Department letters authorizing the flights. The letters were sent to each air crew before flights and were signed by a State Department official who may not exist. The AP could not locate Hogan. No official with that name is currently listed in State’s department-wide directory. A comprehensive 2004 State Department telephone directory contains no reference to Hogan, or variations of that name—despite records of four separate transit letters signed by Terry A. Hogan in January, March and April 2004. 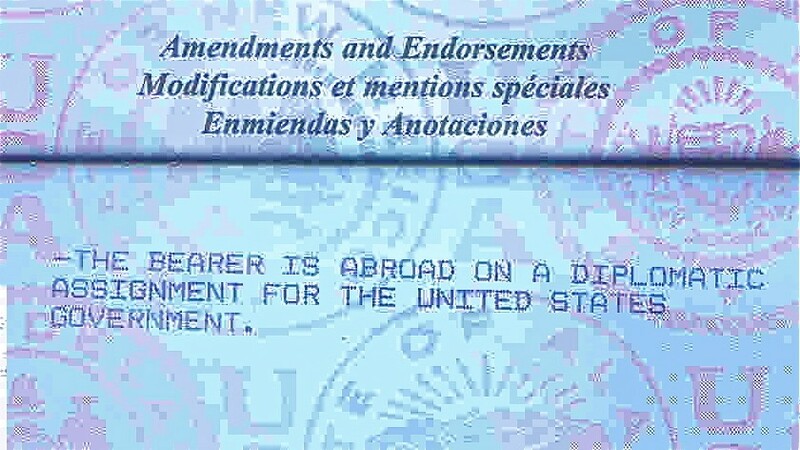 Several of the signatures on the diplomatic letters under Hogan’s name were noticeably different. The secret airlift of terrorism suspects and American intelligence officials to CIA-operated overseas prisons via luxury jets was mounted by a hidden network of U.S. companies and coordinated by a prominent defense contractor, newly disclosed documents show. 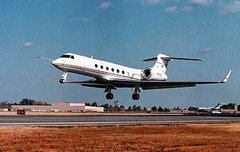 More than 1,700 pages of court files in a business dispute between two aviation companies reveal how integral private contractors were in the government’s covert “extraordinary rendition” flights. They shuttled between Washington, foreign capitals, the U.S. military base at Guantanamo Bay, Cuba, and, at times, landing points near once-secret, CIA-run overseas prisons. The companies ranged from DynCorp, a leading government contractor that secretly oversaw the flights, to caterers that unwittingly stocked the planes with fruit platters and bottles of wine, the court files and testimony show. WASHINGTON – A CIA officer who oversaw the agency’s interrogation program at the Abu Ghraib prison in Iraq and pushed for approval to use increasingly harsh tactics has come under scrutiny in a federal war crimes investigation involving the death of a prisoner, witnesses told The Associated Press.